LG G6 smartphone will have a built-in Quad DAC for "best sound" | What Hi-Fi? LG G6 smartphone will have a built-in Quad DAC for "best sound"
The DAC is made by ESS, a company specialising in high-quality audio chipsets. LG's smartphones are some of the best sounding, and it looks like the upcoming G6 will be no different. It will boast a built-in Quad DAC (digital-to-analogue converter), the company has announced, which promises improved sound quality. The DAC is an upgrade of the version found inside the LG V20, so it won't be a separate add-on module like the Hi-Fi Plus DAC - developed with B&O Play - that worked with the LG G5. It should also bring static noise down by around 50 per cent, and will control the left and right channels separately. The phone also promises to have an edge-to-edge screen and unique 18:9 aspect ratio. 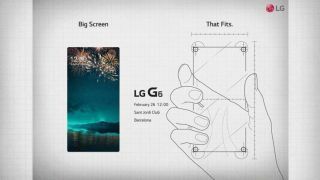 LG will unveil the handset on 26th February, a day before the Mobile World Congress trade show starts.